Clients of AAFX Trading are offered a choice of 2 account types, Fixed and ECN. As its name suggests, the Fixed one offers fixed spreads, while spreads on ECN account are variable and tight. Unlike most brokers, this one does not charge ECN account holders with commission. Both account types offer micro tradeable lots and leverage up to 1:2000, which is super high. We advise traders to exercise caution when using high leverage ratios, for they involve greater risk. 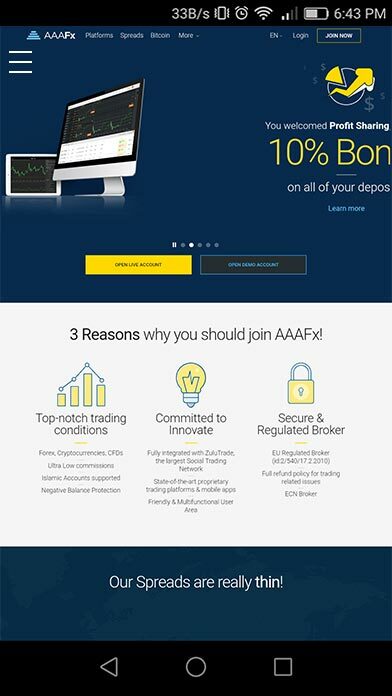 AAFX Trading offers a Refer-a-Friend bonus from 5% to 10%, depending on the deposit amount of the referred one, which gets 30%.It also provides a 30% welcome tradable bonus to clients who deposit a minimum of 500 EUR/USD. This brokerage supports the popular MetaTrader 4 (MT4), which comes in desktop and mobile versions.MT4 is the preferred software by most traders, because it is advanced, yet user-friendly trading platform. It offers a number of technical indicators, extensive back-testing environment, advanced charting package and what is more – Expert Advisors (EAs). By downloading ready-made or creating their own EAs, traders may fully automate their trades.The broker used to support the Vertex trading platform, but has abandoned it. Why Choose AAFX for Currency Trading? There are plenty of forex brokers out there in the market and we have differentiated ourselves from rest of the herd by focusing on providing top notch customer service to everyone including advance traders & beginner forex traders. AAFX Trading consists of specialized team that have immense experience in currency trading and other commodities such as gold, oil, bonds and so on.